The Cause of Condensation on your Windows | Brock Doors & Windows Ltd. Brock Doors & Windows Ltd. 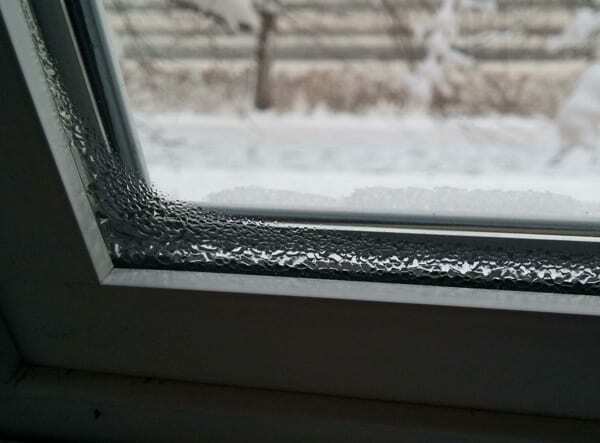 The Cause of Condensation on your Windows | Brock Doors & Windows Ltd.
Once the cool weather arrives, it’s common to see condensation built up on the inside of your windows. Most homeowners assume that this means there is something wrong with the installation or window itself, but that’s not the case. In this article we will take a look at the causes and solutions for condensation on your windows. Commonly homeowners will see condensation on the glass during the colder months of the year. It’s not caused by your windows or doors. Air that has a high level of humidity holds water vapour until it can make contact with a surface that’s temperature is equal to or less than its temperature (dew point), which then turns the vapour into water (dew). Since windows are typically the coldest point in your home, that’s where homeowners will see condensation in the form of water droplets or frost. Essentially, you’ll see condensation on the inside of your windows when the warm air inside comes in contact with the colder windows. The relative humidity level of your home and the exterior temperature will affect how much condensation you see. Routine household activities are the cause of condensation, including bathing, cooking, running the dishwasher or washing machine, and even mopping the floor. Unless your humidity level is less then 10 percent, it is impossible to completely avoid condensation. A common misconception is that condensation is a result of needing new windows, or that the windows aren’t sealed properly. It’s actually a good sign because it means your home is tightly sealed and as a result the condensation has nowhere to escape. Therefore, you’d need to manage the humidity levels in your home yourself. 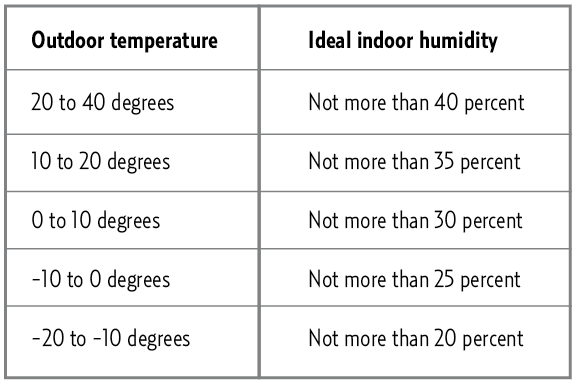 This chart shows the temperature outside vs. appropriate humidity levels inside. You can reduce or remove condensation by controlling the humidity levels in your home. Many new HVAC systems come with humidity controls or you could purchase a hygrometer which is an inexpensive manual means to measure humidity levels. This way you can get an idea of the areas in your home which are experiencing higher levels of humidity so you can get to the root of where the condensation is originating from! If you have a humidifier in your home, you should start by shutting it off. Also move plants away from the windows because the water evaporates from the plants and travels straight onto the glass. Heavy drapes or blinds/shutters that are always closed can worsen condensation issues on the glass because they reduce air flow. As well you can open a couple of windows for a few minutes to let the condensation escape. Over all the best solution involves ventilation and air circulation. Ensuring your laundry room, kitchen, and bathrooms are well-ventilated with windows and exhaust fans will cause the biggest decrease in condensation. For over 25 years, Brock Doors and Windows have been providing homeowners with expert advice when it comes to doors and windows. If you’re concerned about your home, click here speak to an expert or call 1-800-449-3808 today! !